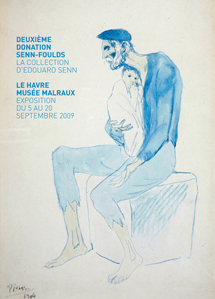 In 2004, Hélène Senn-Foulds donated her grandfather Olivier Senn's collection of artworks to the City of Le Havre for the Musée Malraux. This extraordinary collection of 205 pieces graced the Musée Malraux with the finest Impressionist collection outside of Paris. On July 8, 2009, Hélène Senn-Foulds once again honoured the City of Le Havre with the generous donation of the collection that belonged to her father Édouard Senn: 67 new artworks thus joined the museum in the form of 42 paintings, 15 drawings, 5 prints and 5 sculptures. Son of the great art enthusiast Oliver Senn, Édouard Senn (Le Havre, 1901–Sallanches, 1992) was, like his father, passionate about the art of his time. He moved to Paris in 1940 and began his own collection, purchasing works on whim, through chance encounters, and taking advantage of opportunities on the art market. That is how he came to own the masterpiece of his collection, bought at a public auction in 1966: a watercolour of an old beggar from Pablo Picasso's Blue Period. Steeped in a gnawing melancholy, bathed in azure and ultramarine blue, the works from this period strive to portray a fallen humanity, emaciated by work and hunger, plunged into a profound solitude. The watercolour is dated 1904, the year the young Picasso moved to Paris. Five years later, Édouard Senn acquired another major piece that is moving in more ways than one. Nicolas de Staël (1914–1955) painted Landscape or Cannes shortly before he took his life in Antibes. In the meantime, Senn took an interest in the artists of the interwar period, such as Charles Lacoste, André Dunoyer de Segonzac and Yvan Pougny. But his preference leaned more toward contemporary works painted between 1950 and 1980, showing strong loyalty to the artists he appreciated and supported such as Hungarian-born Endre Rozsda, Pierre Lesieur and Roger Muhl. Like his father, his tastes drew him toward intimate interior scenes, delicate still-lifes and landscapes, for he was a man of his time marked by tempered abstraction, with a prevailing focus on colour, and the legacy of Matisse. And yet he did not overlook sculpture, purchasing two fine works by Étienne Hajdu in particular, as well as drawings by sculptors. The collection built up by Édouard Senn is a testament to his lifelong commitment to art. Following on from his father's collection, it demonstrates a fascinating approach to the highly personal act of collecting, driven by passion. Rather than striving to complete the ensemble his father created, Édouard Senn protected its integrity, made it available to art historians, and promoted it through generous loans to the world's finest museums. For his own collection, he enjoyed the intimacy of artworks chosen through his own discoveries and artistic sensibilities.